I comprehend perfectly. I have a few ideas and I am going to share them with you in case you, too, are headed back to school this summer. For simplicity’s sake, Megan and I agreed that she would probably wear some sort of white pants — denim or twill — and a pair of beautiful block-heeled sandals that she bought last summer. So what do we need? 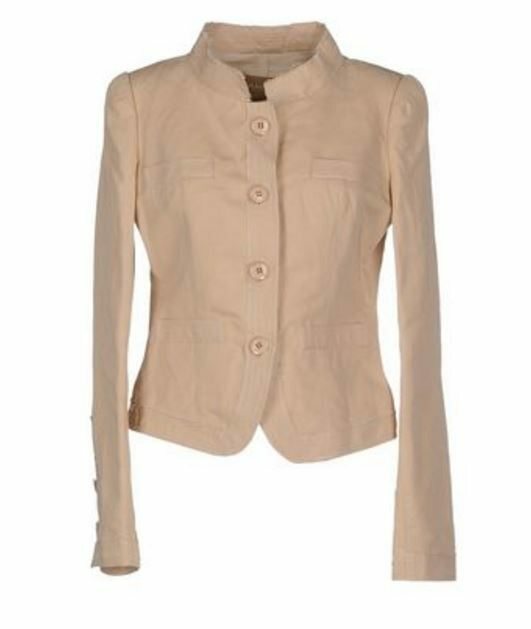 A great top and a smart jacket, bien sur. I am envisioning a palette selected from navy, black, white, and tan. 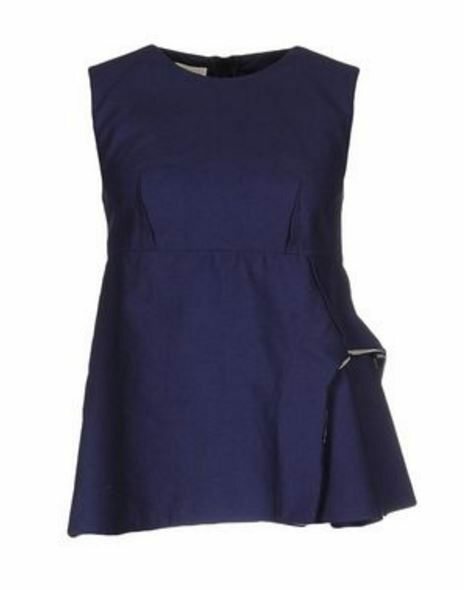 A fetching top in any compelling color, however, could knock navy off the table. 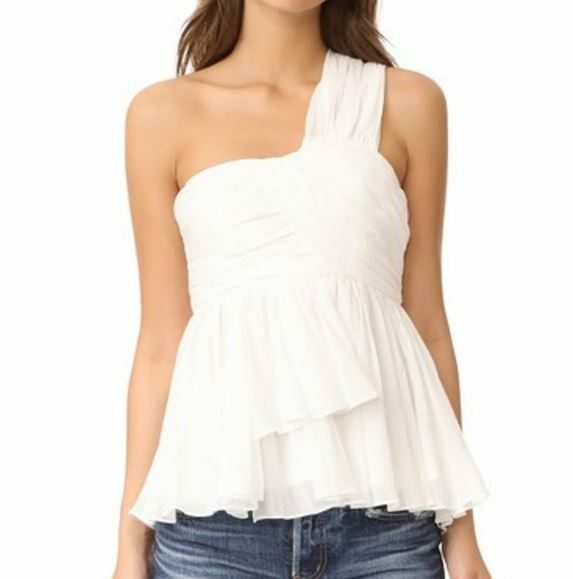 For reasons I cannot explain, I feel drawn to one-shouldered tops. They seem very fresh to me. Megan and I are united in our dislike of cold-shoulder tops. ** The concept drives me crazy (fashion compromise? why?) and the execution depresses me because they often look so droopy. But these two tops overcame my principled dislike and I am setting them before you, like a cat laying a dead bird at her owner’s feet. Megan has already rejected them. And now a few regular sleeveless options. 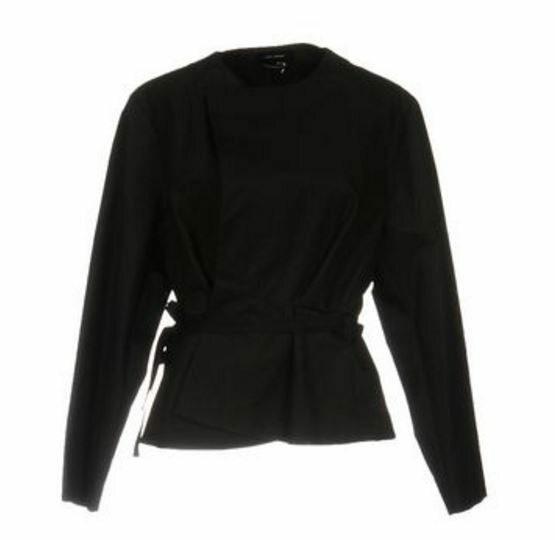 I found rather slim pickings looking for jackets on YOOX, Shopbop and Neiman Marcus. I do like all of these. If money were no object, and I were going to this reunion, I would wear one of these. Yes, those are fish swimming downstream! If you have had a recent reunion triumph (sartorial class), please do share. Tell us what you wore! ** Megan and I are united by so much more. We lived together in college and for three years afterwards. We speak to one another in a coded language derived in equal parts from Pride and Prejudice and Spinal Tap dialogue, typo-speak, predictive puns, and baby-talk, and when we are physically in the same place, we may do so while practicing a two-step. 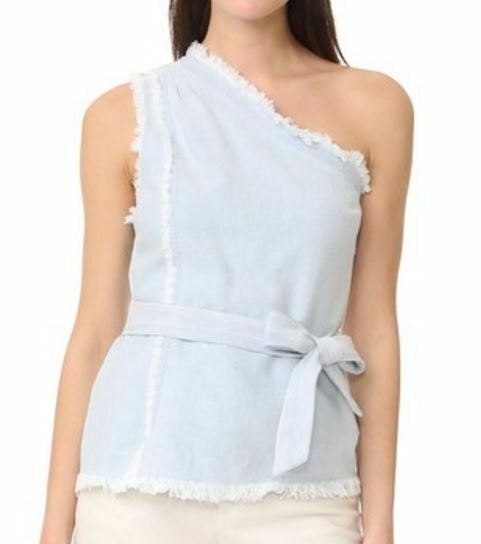 I *cannot* get behind a one-shouldered top. They are too Wilma Flintstone for me, and definitely look like one is trying. That Matches dress with the fish is divine!!! I am putting in a strong vote for that middle sleeveless top with the multicolor mosaic pattern. Great with Megan’s hair. Definitely awesome-but-no-one-can-prove-you-were-trying. Plus then I can borrow it for my upcoming 40th HS reunion! 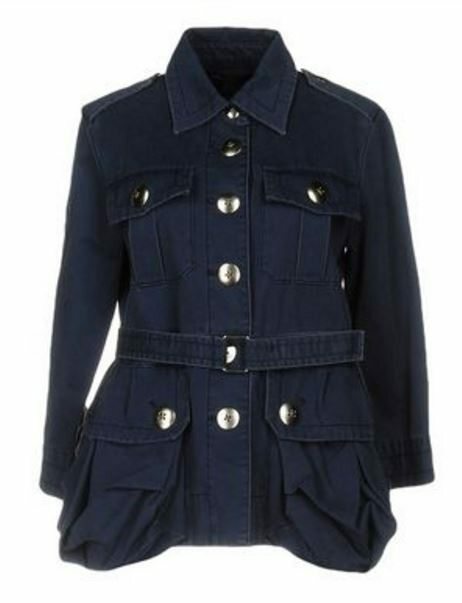 I like MSGM from YOOX and Ermanno Scervino fromYOOX in tan. 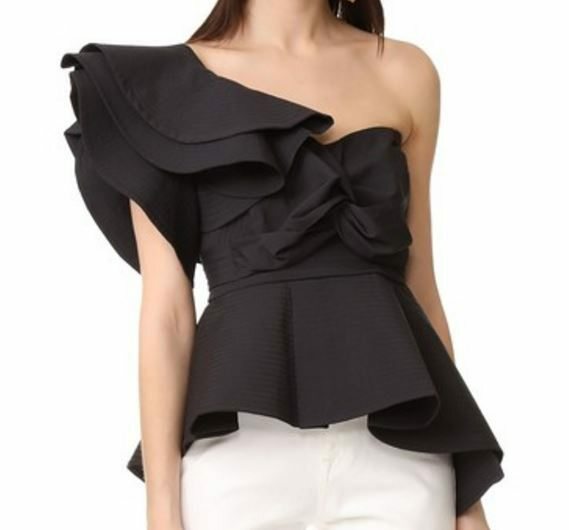 The style keepers ruffled one shoulder top is amazing but it would be difficult to wear a jacket over top. 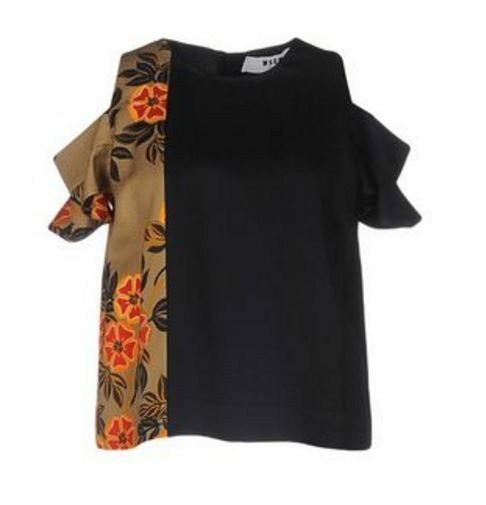 The MSGM patterned top would look nice with a navy jacket and light coloured pants. That ensemble gets my vote; it would be smart and comfortable. Elizabeth, you are in luck! 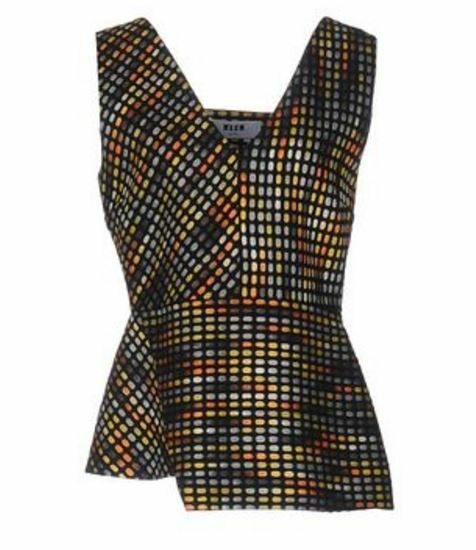 I ordered the mosaic top, plus two others that the generous, thoughtful Directrice directed me to. Will try not to spill anything on it so you can borrow it in… 4 years? All hail Missannethrope! I love the image of your hot self bestowing kisses on the bald spots of your former classmates. Those one-shouldered and cold-shouldered (I never knew they were called that) look. . .not good to me, and definitely like one is trying. Sleeveless tops. . .yes. 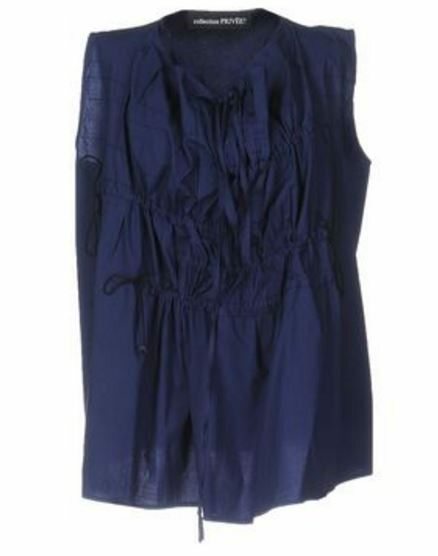 Take a quick look at the Tanya Taylor striped blue dress that is currently available for preorder from Nordstroms. It seems like it would be definitely your style. Love your blog because of your photos, your comments, and your overall look. Thank you, Shirley! Tanya Taylor is a good call. The label (or Tanya herself) makes such lively, active-looking clothes — love the many stripes. No lace Mrs Bennett! 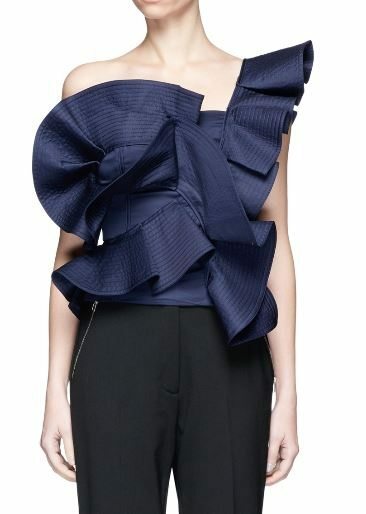 I like the idea of the first tops and the Marni one is lovely, but the last blue ruffle one would be an obstacle to any hugging and/or jackets . . . maybe that is what one prefers? My formula for awesome but not trying too hard is to stick with simple styling but have a really luxurious fabric. Anything one-shouldered does not read as effortless (because at very least you have to sort out special undergarments). I love the fascinating architecture of some of these tops but they would read as “trying” to my eye. Were it me, I would probably choose an Elizabeth Suzann silk top and a fabulous necklace made by a local artist. These pieces would have high re-wearability too. How can I not have heard of Elizabeth Suzann before? It almost seems like a conspiracy to keep things from me . . . such beautiful things. I particularly like the knits. Thank you for pointing me in this direction, Allison! 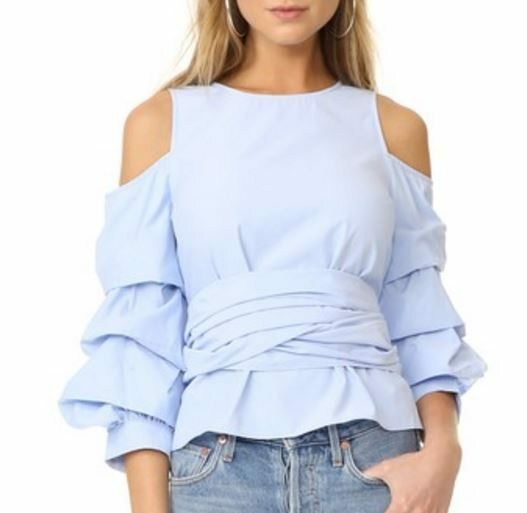 I’m only at my 15th high school reunion, but my go-to summer “I just threw this on” is a *solid* silk Elsa top from Lilly with white jeans. Also, I’m just able to see the last three posts on my phone (safari) despite not being able to see anything after the Stripes post as recently as this afternoon (on desktop Chrome). Hurrah for Directrice bounty!